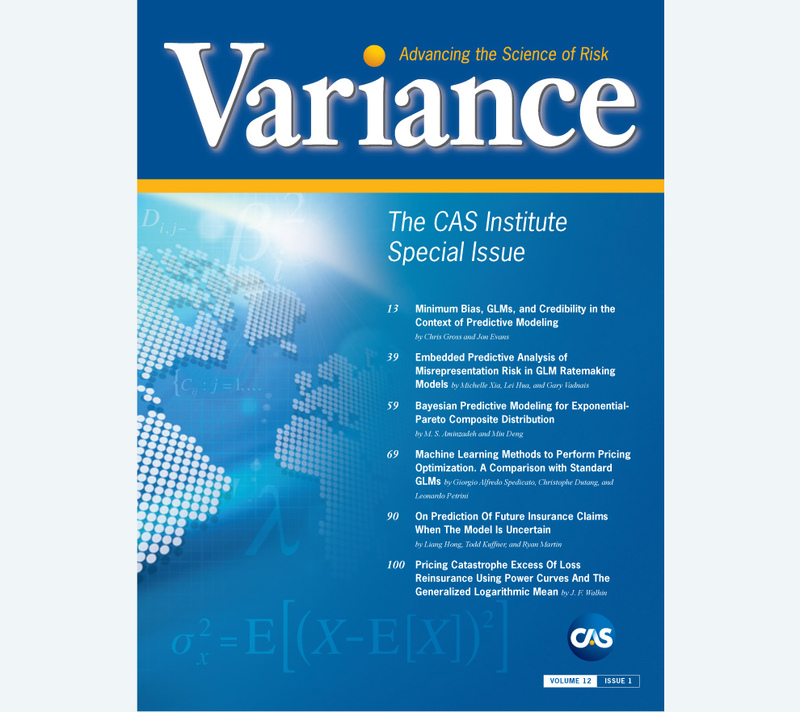 In a new study conducted on behalf of the Society of Actuaries (SOA), the Actuarial Foundation, the Casualty Actuarial Society (CAS), and the International Association of Black Actuaries (IABA), respondents were asked to consider the statement “The actuarial profession is not as diverse as it should be.” The majority of respondents — 83 percent of African-American and Hispanic respondents and 55 percent of respondents from other racial backgrounds — agreed. Consideration of actuarial science as a viable profession. Preference over other science, technology, engineering and math (STEM) professions. Intent to take and pass the exams. The barriers at the start of the pipeline tend to compound those at each consecutive stage. Lack of awareness is the most basic problem. Just 12 out of 100 African-American or Hispanic college freshmen surveyed had heard of the actuarial profession. That’s less than half of the rate for other groups. A full 72 percent of lapsed minority candidates indicated they learned about the profession after high school (Figure 1). This discrepancy has a resounding impact. With lower awareness comes less preparation for the course work once a student decides to pursue actuarial studies, a later start date to begin taking exams, and fewer connections within the field. All of these factors make passing exams, connecting with mentors and landing internships and jobs much more difficult. After awareness, the next hurdle on the career pipeline is for students to consider actuarial science a viable option. 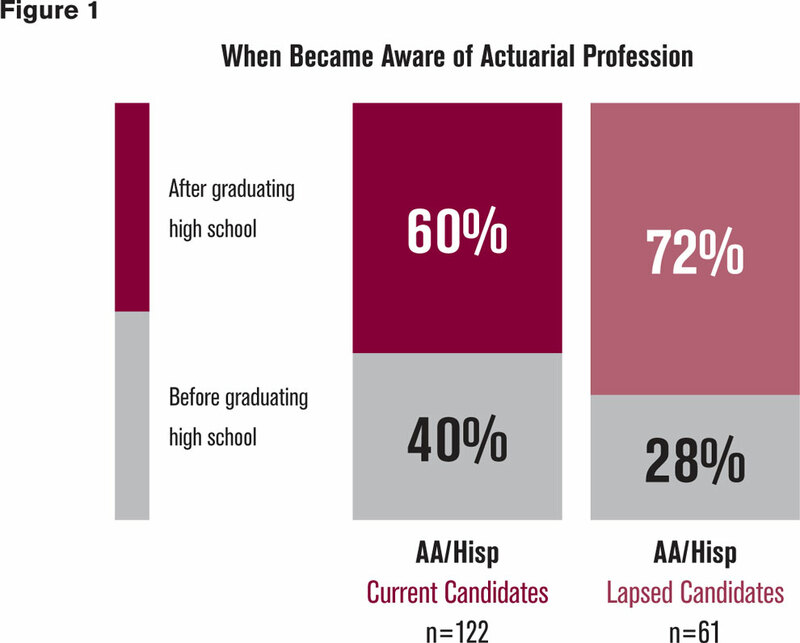 Of minority lapsed candidates who learned about the profession later in life, 36 percent reported that they did not feel they could invest the time and money required to become an actuary. Older students often cannot afford to put off getting a full-time job while they study and sit for the exams. Without enough preparation time, they are less likely to pass the exams. Aware of this — and unaware of financial support that may be available to them — many minority students do not even begin down the road to becoming an actuary. Like all potential actuaries, African-American and Hispanic candidates are impeded and discontinue pursuing the career at each stage of the pipeline, but at a much higher rate. Beyond those challenges to entry, students must develop a preference for the actuarial profession over other STEM fields. This represents the third stage of the career pipeline — and another barrier. “Drawing minority students into the profession requires positioning the career as meaningful, attainable, rewarding, prestigious and secure,” the researchers note. 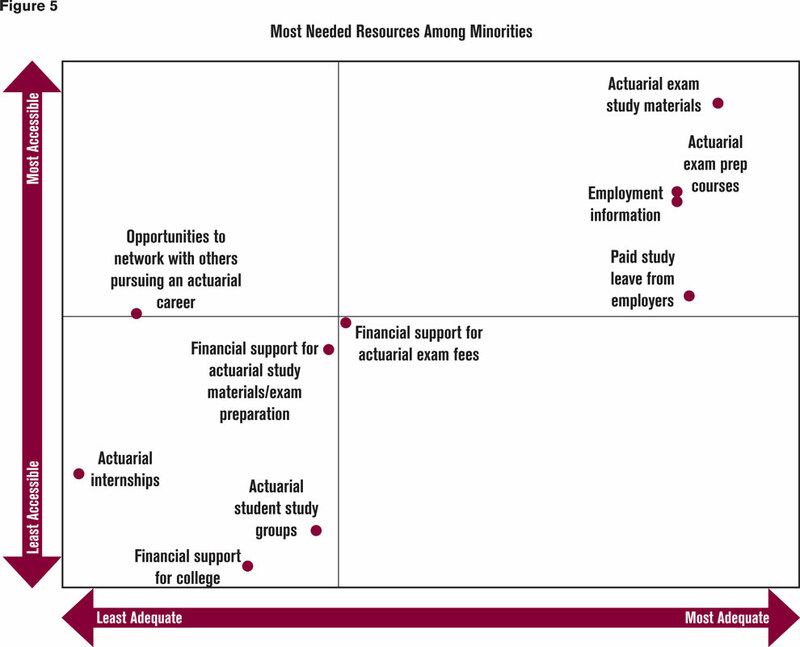 Without those attributes, top-performing minority students are more likely to show a preference for one of the more familiar STEM fields, such as medicine, computer science or engineering. Students who overcome the first three barriers now must take the relevant courses and pass the exams. Although many in the actuarial field have argued that the credentialing process is an objective step that levels the playing field — either you pass the tests or you don’t — the current research complicates that argument. To obtain credentials, candidates need appropriate academic preparation, a support network, and financial support. Yet, a lack of academic preparation and little or no financial support in college are both more prevalent in minority populations than in other groups. Indeed, 32 percent of lapsed minority candidates felt they were not well prepared academically to take the exams, compared to 25 percent of other respondents (Figure 2). 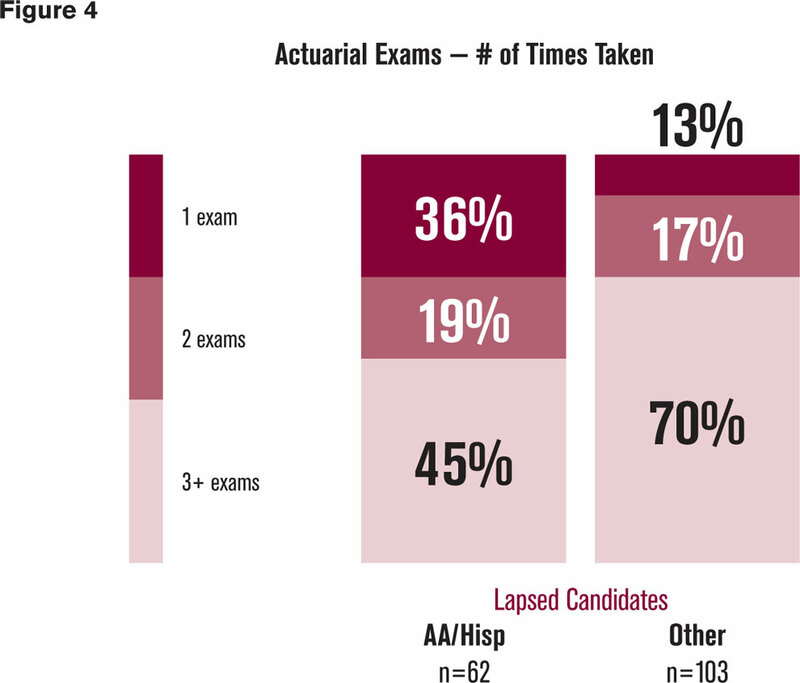 More than half of lapsed minority candidates indicated financial support for exam fees was insufficient to meet their needs, and 31 percent of the same demographic cited the cost of exams as a reason they stopped pursuing a career as an actuary (Figure 3). Candidates who fail an exam have the opportunity to retake it. 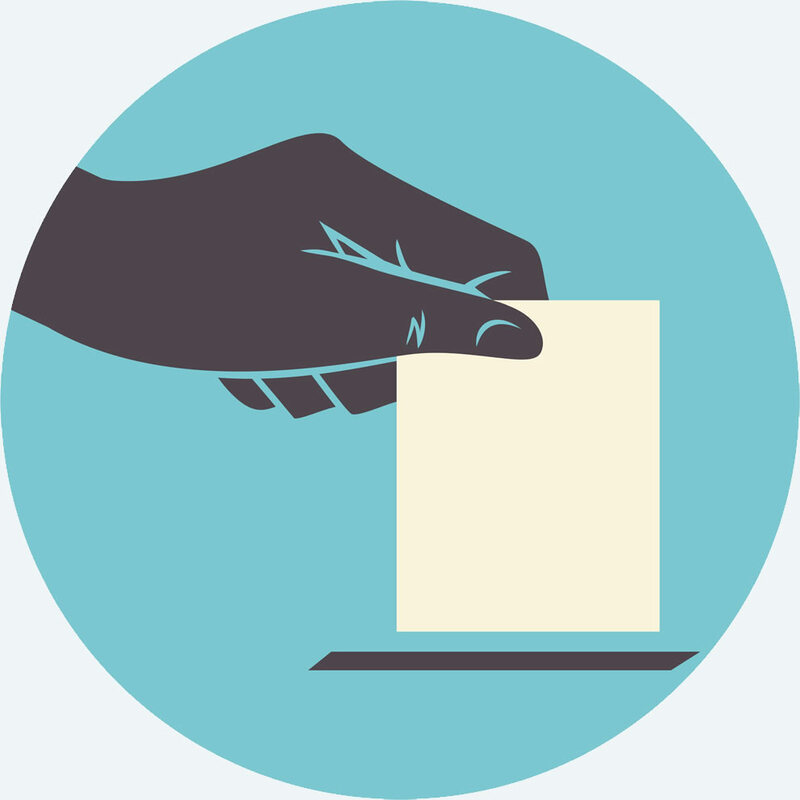 While 70 percent of “other” lapsed candidates took exams three or more times before dropping out, just 45 percent of minority lapsed candidates lasted that long. Perhaps more telling, 36 percent of lapsed minority candidates dropped out after just one failed exam, compared to 13 percent for lapsed candidates of other races and ethnicities (Figure 4). The researchers posit a “confidence gap” as one reason behind these statistics. The discouraging effects of failed exams may be more acute for minority students who often lack mentors and advisors to build their confidence with insight that many candidates within the profession fail exams. This leads minority students to falsely conclude that they are not cut out for this profession. Interviewees also indicated that having to pay to retake the exam was burdensome, and this likely also contributed to the lapsing of some candidates. Screening and stereotyping of resumes based on name, appearance and college. A racially homogeneous community that has a “secret society” feel. Workplace culture that can involve subconscious discrimination. She continues: “I think that if you are a person of color and you fail an exam, without mentors or a network, you might think you just are not cut out for it. You don’t know that everyone is failing exams.” Conversely, seeing someone like you who is successful, “That’s very motivational,” McGruder says. Increasing awareness of both the profession and available assistance. Expanding financial support for exams. John Robinson, former president of IABA and current member of the CAS/SOA Joint Committee on Career Encouragement and Actuarial Diversity, believes the whole report represents areas for improvement. “If we’re going to handle this, we have to do something that we’ve never done before,” he says. When the organizations reach the students sooner, they can head off many of the barriers that the study identifies. To improve the image of the actuary, Jason Leppin, the executive director at The Actuarial Foundation, says, “I like the idea of having more specific stories of what particular actuaries do.” McGruder agrees, noting that the actuarial field is broader than just insurance companies, as many outsiders believe. “It’s important for us to brand ourselves and show exactly what actuaries do. I know actuaries who work at Uber and Google.” By better articulating what the profession does, actuaries can move students from awareness to preference. Employers are also changing their recruiting practices. In the past, some employers have indicated that they prefer to look to certain schools for their candidates, and rarely are these universities focused on serving minorities. Olga Jacobs, the 2017 chair of the SOA’s Inclusion and Diversity Committee, notes, “If you only hire from the same schools … how do I get that diversity of thought that we need to really solve the humongous problems that we have in our country?” To correct the problem, Weaver says companies have begun to shift their recruiting timelines and hold internship spots for IABA scholarship winners. The companies that make these kinds of accommodations, she says, have been most successful in recruiting international and African-American actuaries. To view the original announcement about the barriers to entry research study and download the executive summary of the findings, go to http://bit.ly/2FMmWgN. 1 Barry McKeown, “Diversity in the Actuarial Profession,” Expanding Horizons, April 2014, https://www.soa.org/News-and-Publications/Newsletters/Expanding-Horizons/2014/april/Diversity-in-the-Actuarial-Profession.aspx. Previous PostPrevious Strong Actuarial Analysis or Unethical Data Use? Next PostNext The SLR Factor: As sea levels rise, the flood risk equation changes.